I realize that in some parts of the country, there is still snow on the ground. Down here in central Texas, though, I just finished mowing the lawn for the second time. Whew! I’m grateful that our backyard here is modest, since even this “mild” spring weather is hot to me. 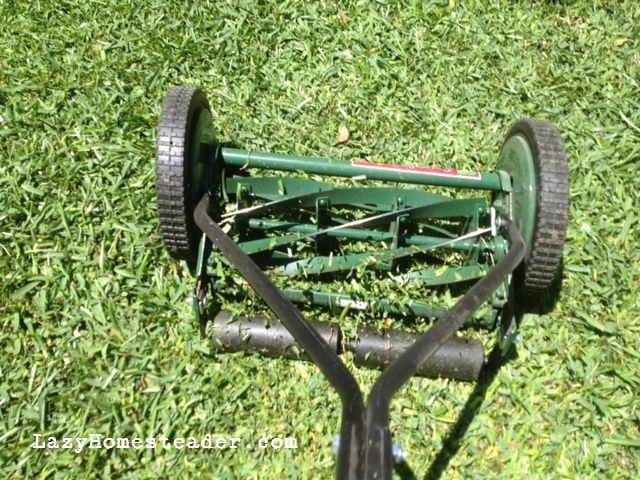 Here are some tips in case you are new to using a push-reel mower and finding it difficult. 1. Clean the yard first. 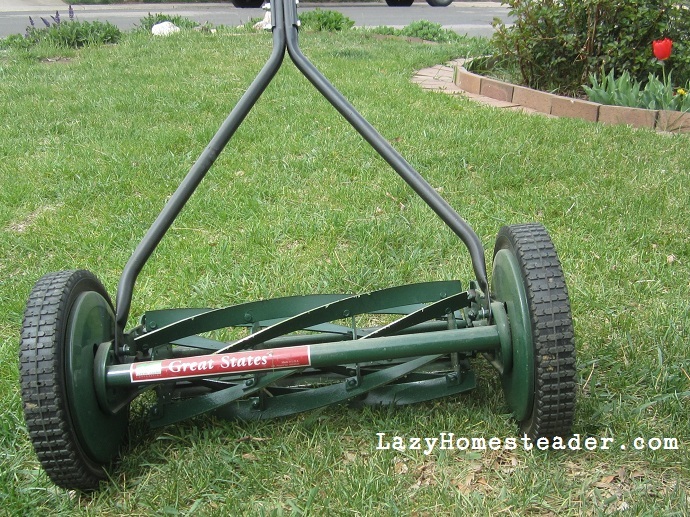 Our power mower could chop up sticks, but twigs will get caught in the reel of the push mower, bringing you to a stop and you’ll have to reverse the blades to get it out before you continue mowing. Frequent starts and stops require a lot more energy than maintaining momentum. A few minutes spent looking for sticks and rocks and small kids’ toys, anything that might get caught in the mower’s blades, and removing them from the grass before you get started is time well spent. 2. Set your blades higher. Longer grass uses less water, and higher blades will promote that, taking just a little off the top. If you cut the grass shorter, it might need more passes of the mower, which can double (or more) the time you spend mowing. 3. Mow more often. While longer grass is good for water conservation, let it get too long and you’ll have trouble getting the push mower through it at all. This is especially true of thick lawns or lawns with hills. Our new lawn has a bit of a rise in one area and that grass is harder to mow. If we were to “let it go” it would be very difficult to cut with the push mower. 4. Use a trimmer for the edges. I’ve had a hard time getting the push mower to do a good job cutting the grass at the edges of the lawn where it meets with the fence or the patio. Instead of struggling over those areas over and over, I just mow as close as I can and then clean up the edges with the trimmer. 5. Mow in sections. Our front yard here is about the same size as it was in Colorado, but the grass here is thick and harder to get the mower through. It makes the job tough for me in the heat (I know! Wimpy Colorado girl in Texas!). Instead of sweating my way through the whole job at once, I break it into two or three more manageable chunks. The mower is lightweight so it’s no big deal to walk it back to the backyard while I take a break, get a drink or water my garlic. Then after I’m refreshed, I take on the next section of lawn. I can still get the job done, both front and back yards, in under an hour including the breaks. During a long talk with Rick at the beginning of November, during which I was feeling quite overwhelmed with projects and homeschooling and life in general, I decided to go ahead and normalize our kitchen again. We plugged the fridge back in. We unplugged the fridge in May of 2011. It was supposed to be a month-long experiment. We left it unplugged for a year and a half. So, I guess in that way, it was a total success. We had a great system down, and we pretty much forgot what life with a refrigerator was like. I liked it, being weird and different and extreme. But also, Rick and I were getting to the point where we craved a little normalcy and simplicity in our lives in general. 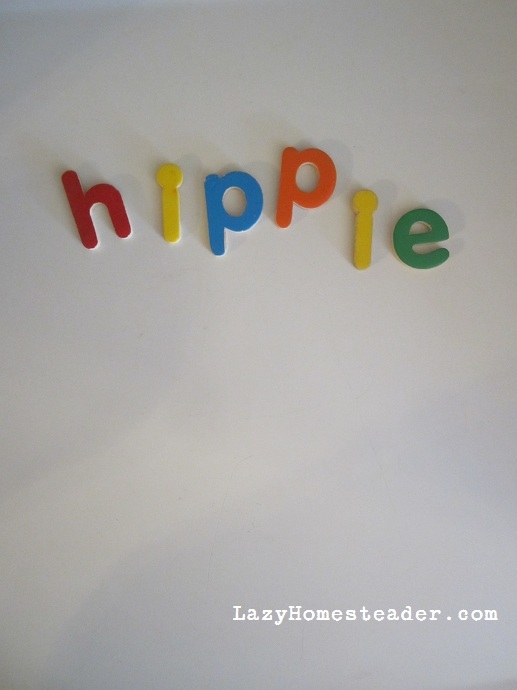 The fridge was a sort of symbol for me of this crazy, hippie extreme life that I wanted to have. And, Rick, being super supportive, has come along for the ride, and for the most part, we have that life. We grow our food or buy from local farms, we have chickens and bees. I never buy cereal or use paper plates or paper towels. I’ve made our own laundry soap and dishwasher detergent. We’ve cloth diapered (3 kids), etc. You get the point. But sometimes being weird can wear on you. It was wearing on us both (not the fridge, but you know… everything). One of my good friends talks about how tough it can be to live in two worlds. 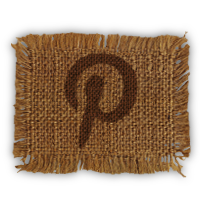 You know the two… one in which all your friends only buy gluten-free, sustainably harvested, BPA-free, GMO-free, soy-free, local, handmade, hand loomed, home-grown, vegetarian fed, and free range. And the other world: the on sale, easy clean-up, big box, double coupon, plastic, convenient, drive-thru, battery operated, disposable one. I mean, take a kid’s birthday party. Imagine hosting 25 people but using nothing disposable. No paper plates or plastic forks or crêpe paper streamers. Or if you do use plastic cups you feel guilty, even for the biodegradable ones. The guilt. So I decided to let go. Not of everything. Sometimes I use a paper towel or 100% recycled paper plate. The fridge was something simple that could go back to normal, not be so weird. You wouldn’t believe how novel it felt. Having a freezer inside the house, having room for anything in the fridge. We hosted Thanksgiving dinner this year. I let the turkey thaw in the fridge, and there was room for other things. It was amazing! (By the way, we also hosted T-day without a fridge, it’s totally doable). This doesn’t mean I’m going all conventional, back to disposable everything. But it does mean I’m giving myself more grace. I don’t need to be perfect or extreme. I just need to keep trying. It’s the winter solstice. The days are going to get longer and spring is on the way. 2012, you have gone by so quickly. 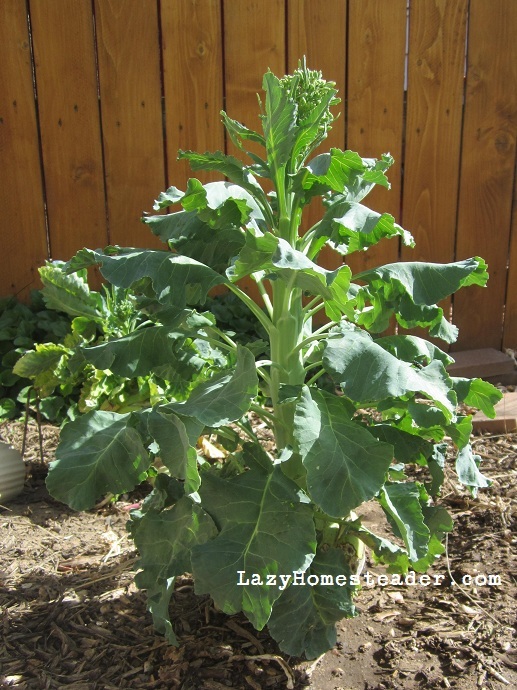 Grow enough in our own neighborhood gardens to feed ourselves for the summer. Start a monthly potluck circle. So how did we do with those? Well, we tried to grow the pumpkin. We planted it, we watered it, we fed it compost tea. But it only got to about the size of a volley ball. So next year, we will have to try again. Number two, well… not quite yet. We’ll keep on that road. 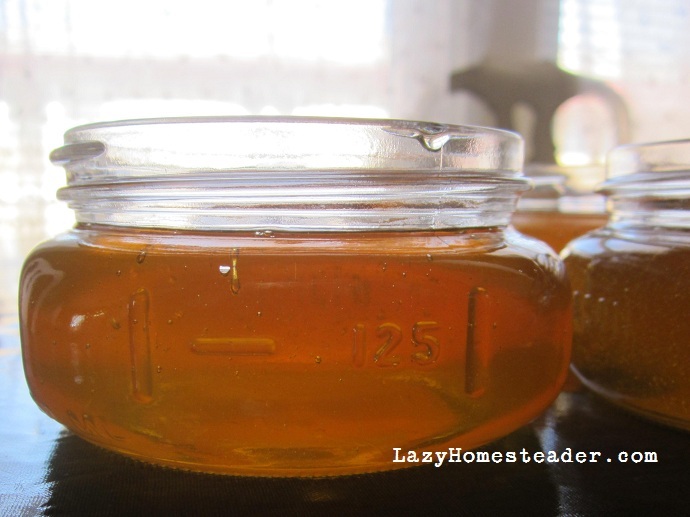 We did process chickens this year, as well as harvest our own honey, though. The potluck. We started the monthly potluck in February. We have hosted one every month since then except in June (kids were all sick) and November (we were out of town, hunting). And this is one resolution we are definitely keeping up with. I’m still thinking over what my resolutions for the new year will be. Do you have any resolutions for yourself yet? How about ideas for me? Something you want to see me try? 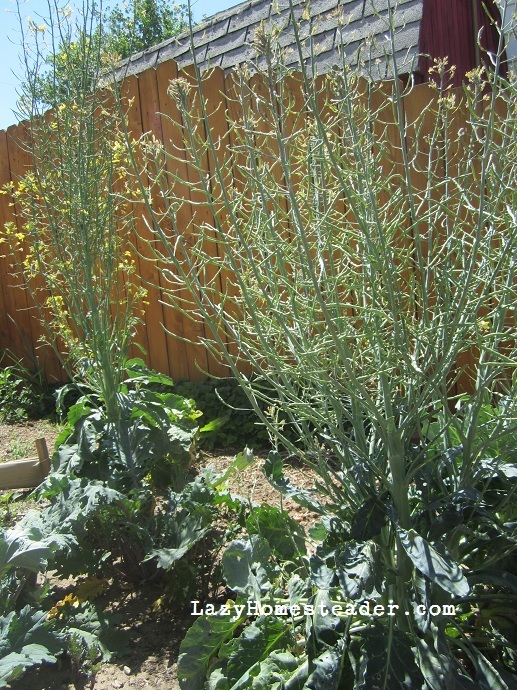 I’ve mentioned before that we grow a variety of kohlrabi that get very large without getting woody. The seeds are from Slovakia, Rick’s grandfather brings them to us. 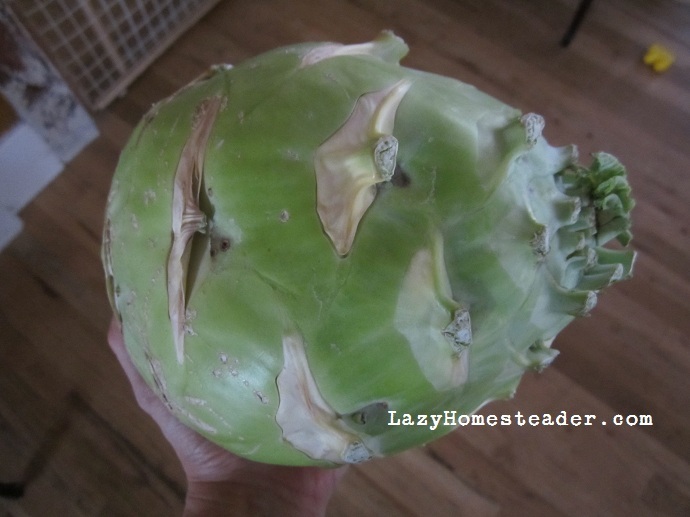 Because we’ve never found this variety of kohlrabi in a seed catalog or garden center, and because Rick’s grandparents don’t go back to Slovakia regularly anymore, I decided that I better figure out how to save kohlrabi seeds. 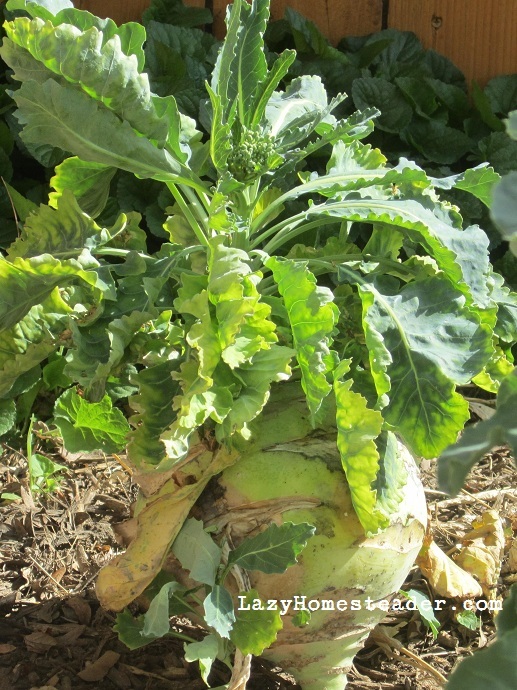 Kohlrabi is a biennial, meaning it won’t go to seed until its second year of life. 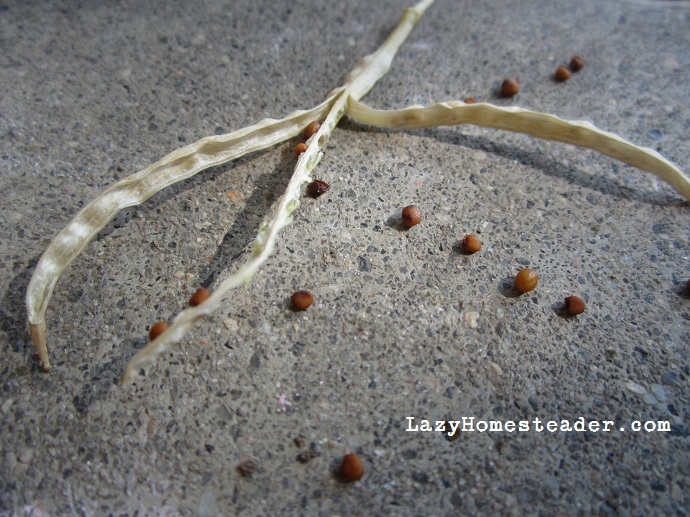 Which meant in order for us to gather seeds, we’d need to keep it alive during the winter. Last fall I left five large, healthy, likely looking candidates in the ground. I imagined that I’d heavily mulch them with straw or leaves or something, but I never got around to it before the snow came. So we took our chances. As they continued to grow, they cannibalized their bulbs and sent up great big stalks. By May they had grown flowers. Yellow ones. At the end of June they were setting seeds. 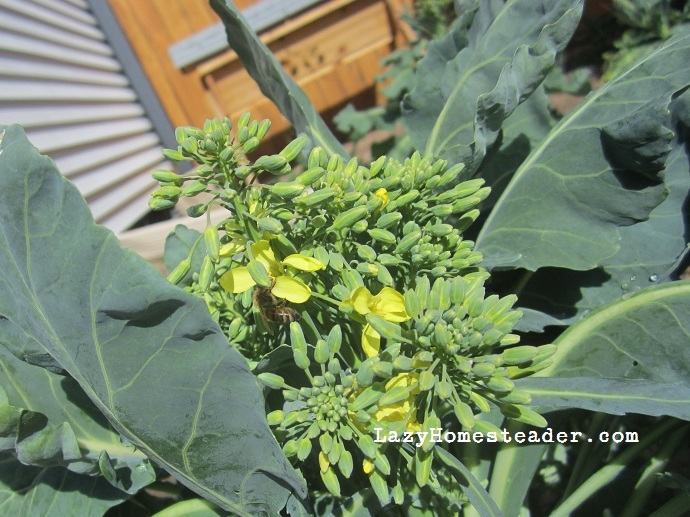 In July the pods started to dry and the birds started pecking away. I was pretty nervous about losing everything that I’d been keeping alive for two years. But I held out a little longer and when most of the pods were brown, I cut the stalks off and took them to the garage to dry completely. And I am happy to report success in saving our first seeds ever. I’m still working on separating them from the chaff. I’m sure there’s a better way than what we’re doing… there has to be. But I am very pleased that we will still have these special seeds. Have you saved seed before? 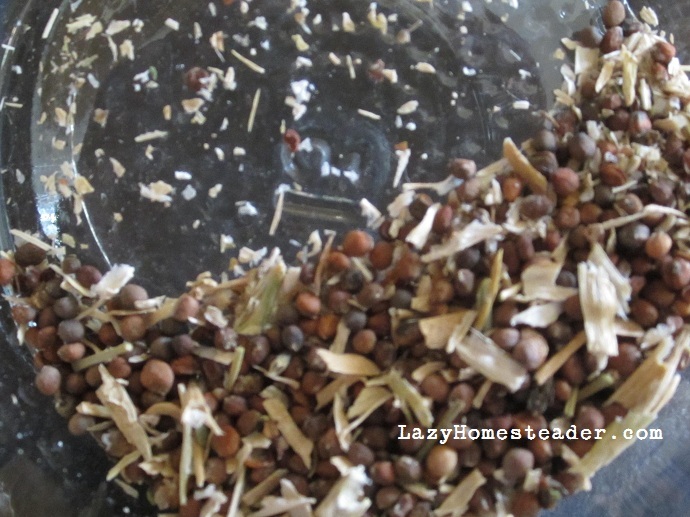 Do you have a trick for separating the seeds from the chaff? Someone recently asked me how the fridge experiment was going, and I realized that I missed the anniversary of when we first unplugged! To me, that’s a pretty good sign that the project is going well. The anniversary came and went totally unnoticed. I imagined (a year ago) that I’d want some sort of fanfare or some official celebration, but I realize that it is better this way. Running our home without a fridge has become so much a part of our lives that it’s almost mundane to us. I forget about it completely until someone asks. Changing ice jugs is routine. Although we eat mainly fresh food, I don’t shop daily as many people have asked (I have three kids, people, are you nuts!??! ), we love dairy (we regularly have milk, yogurt, cheese, half and half and butter in there), and none of us have suffered from Listeria. Is it for everyone? Well… I think that if we can do it with three children, probably most other families could too, certainly most single people. But I realize that living without a fridge in 2012 is pretty far on the other side of the extreme line for many people. It hasn’t really been an inconvenience for us at all. I think the key to making it successful for us has been thinking outside of the box. Many people we’ve talked to about it say they like the idea, but they could never do it because they prefer fresh food too much or that it’s not possible in an urban environment. We are doing it in Denver and eating fresh foods (including meat and dairy)! It is basically like using a cooler when camping. We’ve even gone out of town and left it. Of course it would not be practical for us at all if we did not have the freezer in the garage where we could regularly get ice jugs. But we run the freezer regardless. So how long will we keep going? Right now, we don’t see a reason to stop. The only question now is what to do with the refrigerator? Use it for storage for things prone to pests, like flour? Make a pantry out of it? A china cupboard? Long-term food storage area for the zombie apocalypse? Fireproof safe? We’re currently taking suggestions on that one. No Fridge = Saving Money? Like many people around the country last week, we mowed our lawn for the first time this season. The difference between us and our neighbors, however, is I talked on the phone while I did it. We have a push-reel mower. Last summer, I sold my husband’s shiny, red, super-charged, front-wheel-drive, 9 billion horsepower, mulching power mower for this little green machine powered by ye ole chevrolegs. Now I love this thing, and truth be told, Rick hates it. He teases me all the time about how I’m saving approximately 6 gallons of gas a year. If that. And, pretty much, he leaves the mowing to me now, where before it used to be solely his domain. I think he’s embarrassed. But I like it anyway. It’s quiet. I really did talk on the phone while I was mowing the lawn last week. My mom asked me, what that sound was, and I said, “Oh, I’m mowing the lawn.” Then we both laughed. I was talking on the phone while mowing the lawn. Preposterous! I could mow at six in the morning or ten at night and the neighbors would never know. It’s the stealth mower. I actually like the sound it makes. It uses no fuel or oil and takes little to no maintenance. 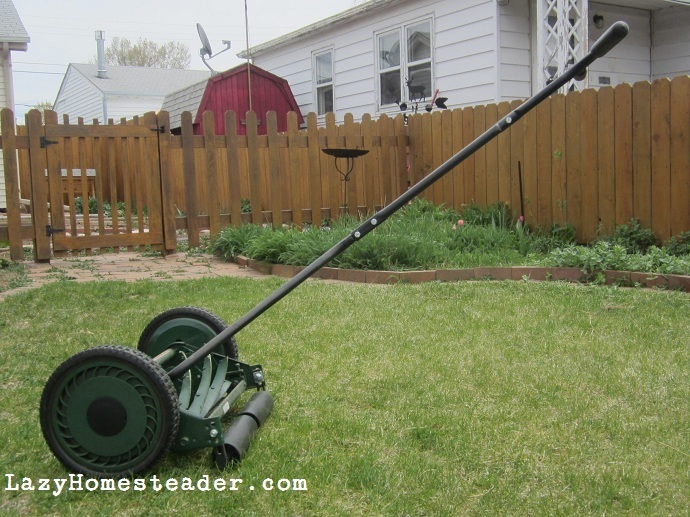 By the time my neighbor is done checking his oil and fuel and pumping and priming, reconnecting the spark plug and whatever else, I’m ¾ the way done mowing my lawn. One time, no joke, with the old power mower I stood outside for like 15 minutes trying to start the thing before I realized the spark plug was disconnected (hubby did this for safety’s sake). The neighbor had to come over and point it out. It’s lightweight. All the power it uses comes from your legs and arms pushing this machine; it’s easy to maneuver and I can easily lift it up the couple of steps to our front yard and takes up very little space in the garage. With the old machine, I could barely get it up the steps, and had to go up all backwards and strategic. It was super heavy and could chop off my arm – the little label on the side said so. There is NO string pulling to start it up. There is no exhaust. No stinky fumes makes me feel all green and hip and environmentally conscious. And also the lack of fumes keeps me from feeling sick. I know six gallons (or whatever) of gas per year is not much, but I don’t mind mowing the lawn now, because I don’t get a headache from the noise/fume combo. You can’t mow over sticks. The power mower mulched and could chop up a stick or a twig that had fallen from the tree in the front yard, but the push mower can’t. I send the boys out in the yard before I mow with the mission to pick up all the sticks. If I accidentally mow over a stick, I have to stop to get it out of the mower, because it will jam the blades. Sharpening the blades will be a challenge. Not many places know how to sharpen the blades of a push-reel mower anymore, and those who do charge a lot for it – almost as much as the mower cost. Since the blades will stay sharp a long time though, we at least have a while to learn how to do it ourselves. It doesn’t always get every piece of grass in one pass. Because of this, it is really important to overlap or mow two ways. Otherwise your lawn looks like it’s received a haircut from a barber half in the bag. The neighbors look at us funny. 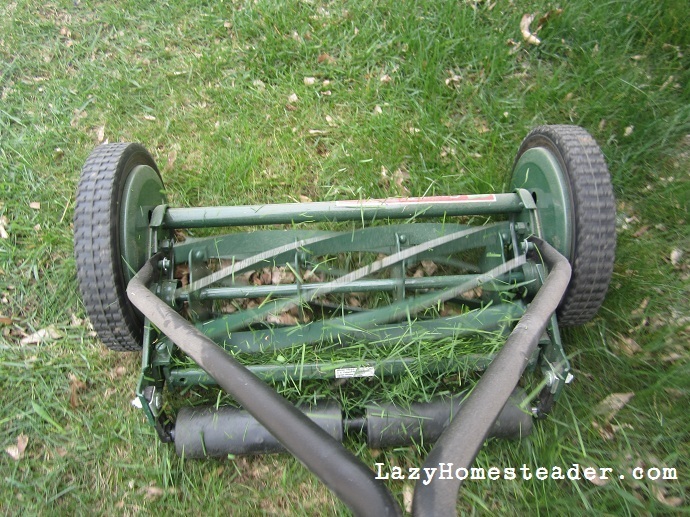 When I first bought the mower, I thought people would think we were so cool – all hip and eco-friendly. Turns out, they either think we are crazy or too poor for a “real” mower. Hmm… this must be why Rick is embarrassed to use it. You can’t be a lazy lawn keeper. If your grass gets too long, the push mower is a real bear to use. In fact, there was a time last summer, when we first got the mower, that we had to borrow our neighbor’s power mower because we had waited a couple of weeks too long to mow and the push mower, literally, couldn’t cut it. Lesson learned. Wow – here it is the middle of April, and I’m just now getting to the March update. Yikes! March was a great month, garden speaking. I actually got my spring garden in on time! I planted a lot really, and am happy to report that potatoes, peas, beets, kale, spinach and arugula are all up already. Some of my lettuce didn’t come up so I’m thinking I’ll have to replant it. A switch must have flipped for the chickens, since March 1st, we’ve collected 99 eggs. Ninety-nine! Plant Something: Potatoes, Alaskan sugar peas, blue curled kale and red Russian kale, yellow cylindrical beets, Ringmaster onions, spinach, arugula, Boston lettuce, red romaine, Tom Thumb lettuce, Little Gem lettuce, peas and oats cover crop blend in the chicken area. Harvest Something: Eggs: 99!! Enough spinach for a pizza and for Emmett to graze on. Preserve Something: Froze 1# pizza dough. 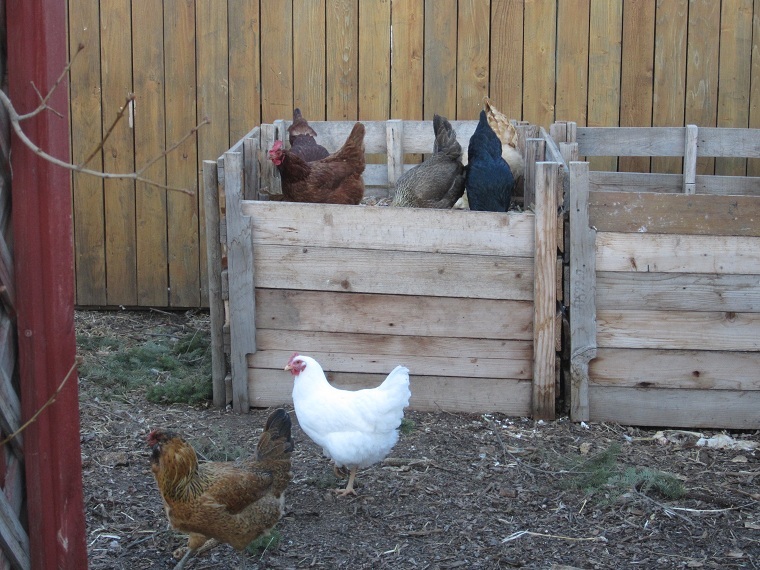 Waste Not: Scraps given to chickens and/or compost pile. Want Not: At the beginning of March, we bought a case of pasta, and at the end of the month we ordered some olive oil in bulk. Also, the neighbor gave us steel posts so we could get started on the last run of the fence, and two old rusty iron tractor seats that we plan to turn into a garden bench. Eat the Food: From the Pantry we’ve eaten peach preserves, peanut butter, strawberry jam, pasta, nuts, plum lavender jam, the last of the dried tomatoes and pickles, pickles, pickles. From the freezer: elk flat steak, bell peppers, tomatoes, corn, black bean burgers, peaches, elk back strap, turkey stock, and pizza dough. Build Community: In March, we hosted our second potluck and a seed swap. It was great to get to know friends a bit better and I got some new seeds (peas, cilantro and hollyhocks). 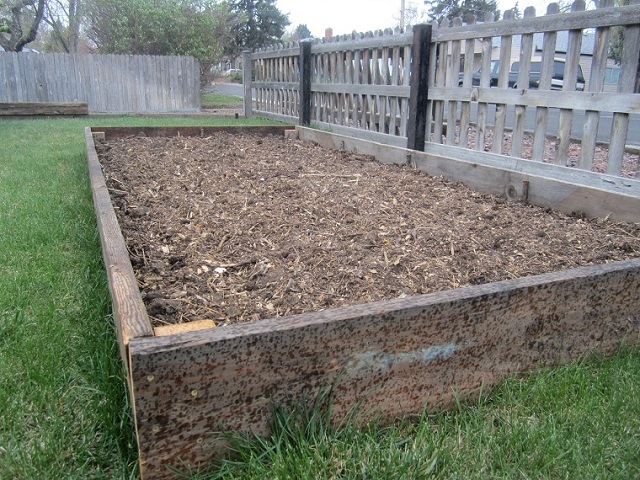 We helped the neighbor get started on a new raised bed in his front yard. Skill Up: Our neighbor showed Rick how to properly sand and paint steel posts. 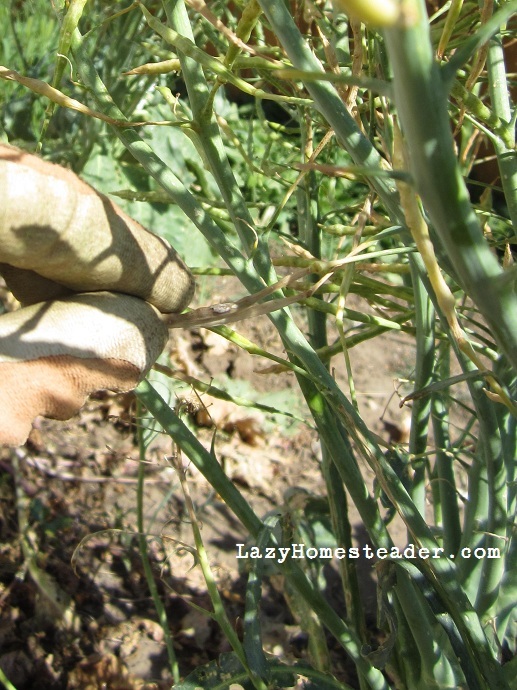 We are headed into one of the busiest times of the year for homesteaders. The planting season is in full swing. We had the warmest March I can remember, not one drop of precipitation in what is normally Colorado’s snowiest month, and it is being followed by a chilly April so far. But everything seems to be growing well, and I’ve certainly gotten the planting itch! How are things coming along at your homestead? CSA season is around the corner and I am very excited to start receiving a share again. We have a month (plus or minus) until asparagus comes on!! I would ideally love to grow everything we eat ourselves, but we just don’t have enough space. 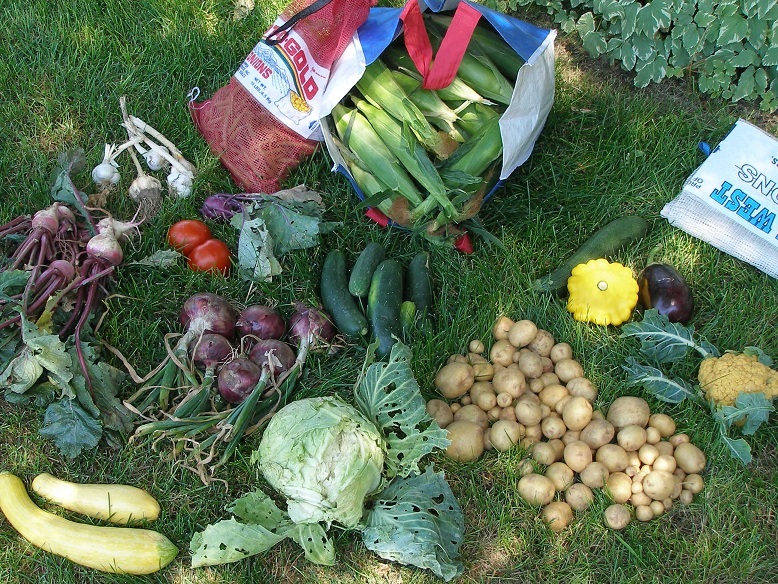 And our CSA grows such beautiful, delicious food, I can’t resist signing up year after year. They take good care of their members, using a blog, Yahoo group and Facebook to help foster community. They’ve even put together a cookbook full of recipes submitted by CSA members over the years. All CSA’s are as different as the members and farmers who run them. Since we are heading into our fifth year with Monroe Organic Farms, our CSA, I thought I’d offer up some of my best tips on making the most of your share. 1. Open the bag and figure out what you have. Most people get their share home after a long day at work. It might be tempting to leave the bag sit until tomorrow, but it’s best to open your bag right away. You will want to store some things right off the bat, and if there is anything delicate in there like lettuce or basil, you’ll want to get it in cool water or the fridge right away. 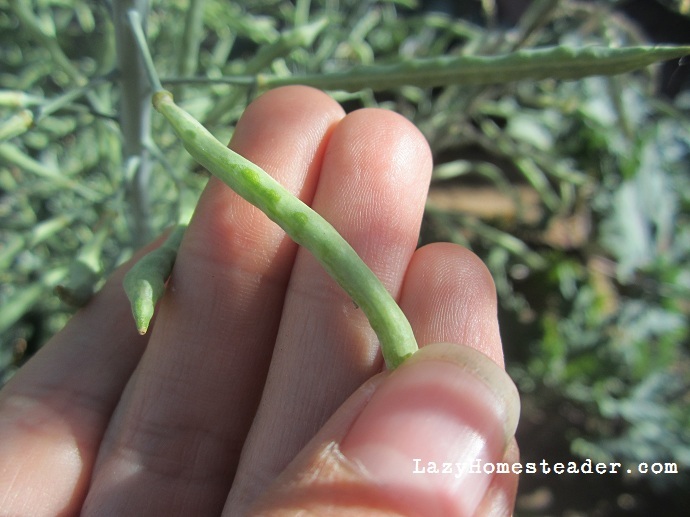 There’s nothing worse than waiting a day or two to get to your share and finding you let your green beans wither and die in the summer heat. 2. Wait to plan your weekly menu until you get your share. I pick up my share on Tuesdays, so I wait until Wednesday to go to the grocery store or market. I spend a lot less this way, and I can plan meals around what we received in our share. 3. Wash and store everything the day you get it. I do my washing outside. The potatoes, carrots, beets, turnips and onions all have a lot of dirt on them. I used to do it in the kitchen, but then I had to sweep, mop and clean the sink too. Instead, I dump my share on the lawn, hose it off and then sort it into what I want to eat right away this week and what I’m going to freeze for later. Freeze what you’re going to save right away so it’s frozen at it’s peak. 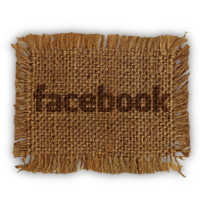 It’ll be just as fresh when you go to use it this winter. 4. Read the newsletter! 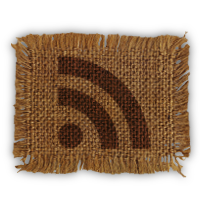 Every week you’ll get a run down of everything included in the share, plus important updates on upcoming distributions and events with the farm. If you read it you’ll know just what that odd looking vegetable is, and you might even get a recipe on how to use it! 5. Use the cookbook. Don’t know what to do with a celeriac? How should you freeze your extra beans? It’s in the cookbook. What to do with all those potatoes? Not sure you like beets? Try a new recipe. All the recipes in the Monroe cookbook are from farm members. They’ve all been tested by real people here in your community. You might just get a new favorite dish. 6. Get involved. Read the farm’s blog and Facebook page. Contribute to the yahoo group or the calls for recipes. Come to the Harvest Festival. This is the community in community supported agriculture. 7. Understand that some things are out of our hands. Some years will be bountiful pepper years, some will be tomatoes, some will be melons. Usually never all three at once. You might have been dreaming all winter of your strawberries only to have them hailed out (please no!! ), or you might feel like you can’t shuck one more ear of corn. But such is life when you are relying on the weather to bring you the freshest local food. Enjoy your melon now, for in November it will be gone. 8. Visit the farm. See where things grow. Check out the chickens, help load the shares onto the truck. Connect with what you’ve invested in on every level. 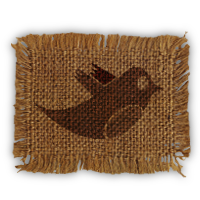 Take advantage of the U-pick crops and the harvest festival. It’s fun, you’ll learn a lot, and you’ll go home with even more delicious fresh food. 9. Be gracious: Be on time, return your bags, call ahead if you can’t make it. Remember that your farmers and the volunteers at your distribution center are people too. Do you participate in a CSA? What are your best tips for making the most of your share? If you’ve arrived here from the Monroe blog, share with us your experiences, favorite part of the CSA and what you are looking forward to most this year!